What D&D setting is Midgard closest to? I was asked a question today, and didn't have a good answer, so I thought I'd bring it to the knowledgeable folks here at the Piazza. A 5th Edition player who has played some previous editions of D&D heard me talking about the upcoming Midgard Campaign Setting and Player's Book Kickstarter for 5e. He asked me, "Which D&D setting is Midgard closest to, and why?" I'm afraid I don't know as much about settings such as Mystara, Greyhawk, and the Realms as I'd like, so I hope to get some answers on here. Out of the settings I have the most knowledge of, I would say that Midgard is closest in tone to Nentir Vale's "Points of Light" feeling. The world is a dark place, with pockets of light, and heroes can make a big difference in turning the tide. It's heroic fantasy with a lot of danger in areas outside of populated areas. It's far from a perfect analogy, but it's the closest I have. Are other settings an even better comparison? Re: What D&D setting is Midgard closest to? Tim Baker wrote: I was asked a question today, and didn't have a good answer, so I thought I'd bring it to the knowledgeable folks here at the Piazza. A 5th Edition player who has played some previous editions of D&D heard me talking about the upcoming Midgard Campaign Setting and Player's Book Kickstarter for 5e. He asked me, "Which D&D setting is Midgard closest to, and why?" I'm afraid I don't know as much about settings such as Mystara, Greyhawk, and the Realms as I'd like, so I hope to get some answers on here. That's tough. It's not like any of them in some ways, but is like some of them in other ways. Tim Baker wrote: Out of the settings I have the most knowledge of, I would say that Midgard is closest in tone to Nentir Vale's "Points of Light" feeling. The world is a dark place, with pockets of light, and heroes can make a big difference in turning the tide. It's heroic fantasy with a lot of danger in areas outside of populated areas. It's far from a perfect analogy, but it's the closest I have. Are other settings an even better comparison? 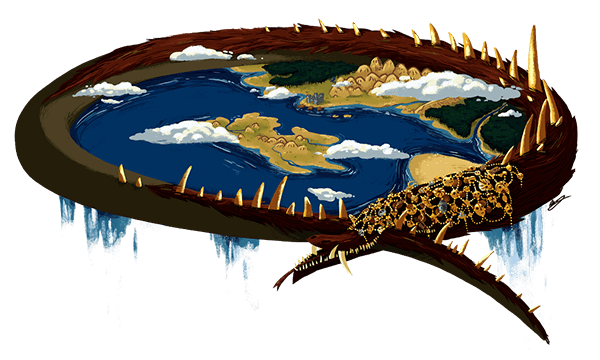 If you look at geography, then Midgard is probably most like Peliore, as both are flatworlds. But there is more to a campaign setting than the shape of it's world. There are quite a few types of environment on Midgard. So parts of it might have things in common with Mystara, Forgotten Realms or Greyhawk. It's also a nordic thing, so it will have stuff in common with HR1 Vikings Campaign Sourcebook. Big Mac wrote: There are quite a few types of environment on Midgard. So parts of it might have things in common with Mystara, Forgotten Realms or Greyhawk. Perhaps it would help if someone was able to summarize how Mystara, the Realms, and Greyhawk are different, ignoring the Hollow World for now (which is clearly one significant difference). Since I'm already familiar with Midgard, if there was a certain flavor that each of those D&D captured best, I might be able to align Midgard (or perhaps only portions of Midgard) to one more than the others. Mystara is charcterized by a "shades of grey" approach -- Thyatis and Alphatia are enemies, but neither is good or evil. Chromatic dragons are not necessarily evil, and the same is true for goblinoids. It draws heavily from the real world for its cultures. It has, in later products, a focus on monstrous PCs. Gnomes are a relatively lesser presence, while the feline Rakasta and canine Lupins are much more numerous. Magical technology peaks at skyships (able to fly to the moon), which are quite common in some areas. Firearms are present, but limited to a single region. The map is similar to prehistoric earth -- with south America, Africa and Antarctica forming a single continent. Mind flayers and drow do not exist, as do many other AD&D monsters (e.g., bullywug, locatah). However, there are several "lost world" areas, such as the Isle of Dread. Finally, the pantheon is huge and many Immortals were mortal heroes in the past -- sometimes recent. Last edited by agathokles on Wed Jan 18, 2017 8:06 am, edited 1 time in total. I'm familiar with FR primarily via the CRPGs and some novels. What seem to me the bigger differences are the focus on drow and other subterranean evil races (in Mystara, subterranean races are no more evil than surface ones), the presence of larger than life NPCs (in Mystara, high level NPCs are either rulers of empires or involved in their own plots for Immortality), and the relatively stronger presence of humans with respect to non humans (dwarves and Elves seem to be declining races whereas in Mystara they are quite strong, and there are large non human nations outside the known world, e.g. the Simbasta of Davania, or the demi-ogres on the Arm of the Immortal and in Tangor). From the little I know of Midgard, it seems to take features from several older D&D worlds, without being especially close to any of them. You get RW cultures as in Mystara and Birthright, but without the dense civilizations and focus on dominion rules of either of these. You have a central "free city" like Waterdeep or Greyhawk, but not many other features from those worlds. Tim Baker wrote: Perhaps it would help if someone was able to summarize how Mystara, the Realms, and Greyhawk are different, ignoring the Hollow World for now (which is clearly one significant difference). Since I'm already familiar with Midgard, if there was a certain flavor that each of those D&D captured best, I might be able to align Midgard (or perhaps only portions of Midgard) to one more than the others. I do not know well enough Midgard or Greyhawk to comment on them, but I do know Mystara and Forgotten Realms quite well. The most important thing I would say for both world is that they are the most developed D&D world (FR mostly by canon, Mystara both by canon and fanon), and therefore so varied and diverse you can hardly summarize them. Agathokles already pointed out some of the unique characteristics of Mystara. I would say both have regions of very high magic (Alphatia, Halruaa, Netheril and Shade) and regions where technology is used (Savage Coast, Lantan) and several regions inspired by RW cultures, even if in Mystara almost every nation or culture is inspired by RW ones, while in the FR some are but the main region of Faerun is a generic medieval/renaissance area, even if the creator, Ed Greenwood, tried to some extent to give it an unique identity, at least in the names of places and people. Thanks so much, Sturm and agathokles. That's super helpful. I'll pass this along to my co-worker at our next gaming session. I think it's a situation where it's impossible to say it's most like any one setting. In that case, the best we can do is provide a summary of some of the similarities and differences, as you've pointed out. I appreciate your input, and it's cool to learn a bit more about these classic settings. Technomagically I would say it is closer to Eberron than any other setting. Angelika Tatsu wrote: Technomagically I would say it is closer to Eberron than any other setting. I hadn't thought about that aspect of Midgard. Yeah, Zobeck and the gearforged have some Eberron-like qualities for sure. BTW: The Southlands (of Midgard) are fairly similar to Al-Qadim. i would say greyhawk. it is really based on mitteleuropean folklore but basic building blocks are the most similar to gary's child. catseye yellow wrote: i would say greyhawk. it is really based on mitteleuropean folklore but basic building blocks are the most similar to gary's child. At it's heart...maybe. I am not hugely familiar with Greyhawk. But mechanically and fluff wise it greatly diverges; Necrotocracy, Gearforged and other elements show that Midgard really isn't [and probably shouldn't be] compared to other settings. From what I see on the whole it takes some of the best elements of some settings in-prin and those OOP and combines them into an amalgamated whole, which creates a new unique perspective on them. What's interesting to me is that Greyhawk has both of those things (civilized ghouls and sentient gear people) but they're not prominent in or characteristic of Greyhawk and in both cases they only exist in Greyhawk at all because of adventures Wolfgang Baur wrote for Dungeon Magazine. So you could say that some of Midgard's ideas were tested in Greyhawk first before Wolfgang Baur made them part of Midgard. ripvanwormer wrote: What's interesting to me is that Greyhawk has both of those things (civilized ghouls and sentient gear people) but they're not prominent in or characteristic of Greyhawk and in both cases they only exist in Greyhawk at all because of adventures Wolfgang Baur wrote for Dungeon Magazine. So you could say that some of Midgard's ideas were tested in Greyhawk first before Wolfgang Baur made them part of Midgard. I didn't realize Greyhawk had these features, or that they were the product of Wolfgang Baur's Dungeon articles. That's quite interesting. I wasn't aware of that either...learn something new everyday. Wow! I'd never heard of Mitteleuropa before. I've heard people talk about Greyhawk, Forgotten Realms and Dragonlance (and to a lesser extent Mystara) all being like Western Europe, but Mitteleuropa narrows things down a bit. It's more niche. You could have Celtic thems to a world and Nordic themes to a second world and Roman themes to a third world without them seeming to samish. "Imagine a world that has lots of classic D&D tropes but avoids overt similarity to other D&D worlds. It blends a mythological feel with lots of high fantasy and epic elements."